Saturday November 24, 2018 1 – 3 pm. I’ll be reading my books and chatting with customers as part of Small Business Saturday at The Town Book Store in Westfield, NJ. Sunday December 2nd, 2018 2:00– 4:00. I’ll be reading LOVE IS KIND & signing all my books as part of Gingerbread Sunday at the Miller Cory House in Westfield, NJ. Saturday December 8 2018 11- 1:00 pm. Join me for festive readings of all my books with puppets, then shop at the Cranford United Methodist Church’s Christmas Shoppe and Soup Festival. Note: The festival is open from 10 – 3pm. Books available for purchase & signing at all events. When Rebecca Gerlings, the illustrator of DIVA DELORES AND THE OPERA HOUSE MOUSE, told me she was going to be one of the featured artists at this year’s The Big Draw Epsom, I was excited and wanted to learn more about the event and her role. What I learned is that The Big Draw is a big deal! The Big Draw is a “a visual literacy charity that promotes the universal language of drawing as a tool for learning, expression and invention” and, according to their website, since their launch in 2000, over four million people have participated. That makes them the world’s largest drawing festival! This year the festival ran from 1–31 October, and involved over 400,000 people from over 25 countries! The 2018 theme was “play” and in Epsom activities included live cellists, chalk drawing on pavements, abstract art in the square, and readings and workshops in the library. Visitors also had the chance to meet local artists, art educators and designers – including picture book author-illustrator Rebecca Gerlings, illustrator of Diva Delores and the Opera House Mouse! Rebecca read Diva Delores and the Opera House Mouse, then lead a puppet-making workshop where children could take home their very own Delores and Fernando. She cut 40 templates for both characters, snipped 40 woolly mouse tails, punched 80 mouse ears, and dotted 120 sticky eyes ahead of the event. The Fernando puppets were made by rolling each brown sugar-paper template into a little cone and securing it with sticky tape. A pair of ears and eyes and a woolly tail later and – voila-la-la! – Fernando! Once the kids had completed their puppets they popped them on stage for their debut performances! All 40 cute Fernando puppets found new homes with their little makers. And in a flurry of feathers and glittery makery so did all 40 Deloreses! It was such a smash that when the templates ran out a half hour before the end of the workshop the resourceful kiddos stayed to make cute characters out of the cotton wool balls meant for Delores’ wigs! Doesn’t that sound like a wonderful day! And perhaps it will inspire you to grab a copy of DIVA DELORES AND THE OPERA HOUSE MOUSE to read with your kiddos. And, afterwards, maybe you, too, can create puppets and put on a show! Happy reading and creating, all! LOVE IS KIND Blog Tour: STOP FOUR ! Today I am delighted to be guest blogging over at picture book author and librarian Lauri Fortino’s blog on one of my favorite topics: USING PUPPETS TO ENGAGE YOUNG READERS. Plus, you’ll get to meet Little Owl, my newest puppet storytelling companion. (And I hear there is a giveaway, too!) Thank you for having me, Lauri. So fly on over, friends. I’ll make it easy for you. Here’s the link. PLEASE COME: Ocean Grove Meet and Greet with Laura Sassi! If you are vacationing along the New Jersey shore, or live there, please stop by this Saturday, August 11, from 1 – 3pm at the Comfort Zone in Ocean Grove, NJ where I’ll be chatting with customers and signing books. I’d LOVE to meet you. And don’t you agree that books make perfect stocking stuffers, birthday gifts, baby shower gifts etc? So, stock up and I’ll even sign them for you to make them extra special. Hope to see you there. Thank you for having me, Comfort Zone! Looking for something fun to do with the kiddos this summer? How about joining me for one of these summertime author events. Meet my storytelling companions – Diva Delores and Fernando – and enjoy a special craft. And if you are vacationing on the Jersey shore the week of August 11, be sure to stop in at the Comfort Zone in Ocean Grove where I’ll be chatting with customers and signing ALL FOUR of my books including my newest LOVE IS KIND which releases with Zonderkidz August 7, 2018. BONUS: I’ll also be introducing my newest puppet companion – Little Owl – at the Comfort Zone. Please stop in at one of these events. I’d love to meet you! SPRING BOOK EVENTS with DIVA DELORES and the OPERA HOUSE MOUSE! Sunday March 11, 2018 2:00 pm. BOOK LAUNCH PARTY! Celebrate a DIVA debut at this special story time and book signing with craft! Barnes and Noble, Rte. 22 Springfield. Wednesday, March 21, 2018 10:30 pm. Join me for an interactive story time featuring DIVA DELORES AND THE OPERA HOUSE MOUSE at the Garwood Public Library. Meet my storytelling companions – Delores and Fernando–and enjoy a book-themed craft. Friday, April 6, 2018 11:00 am. 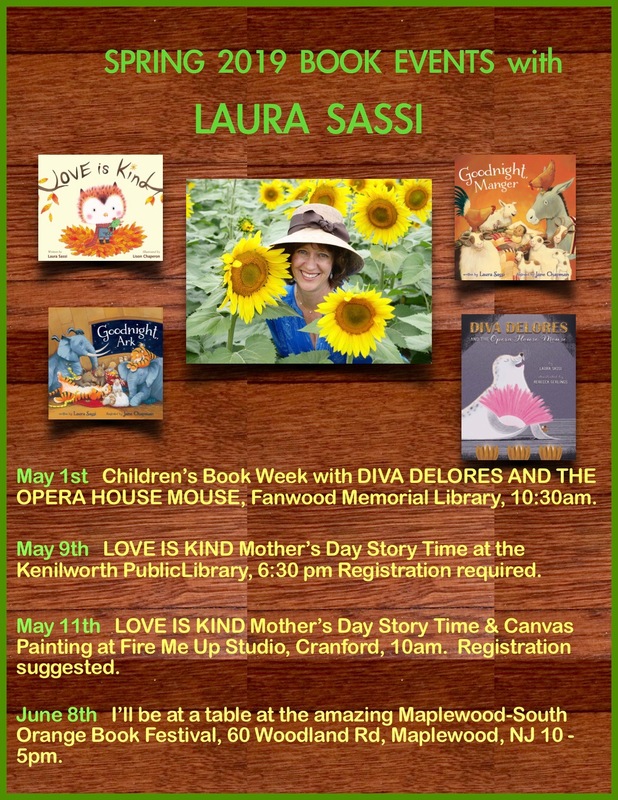 SPECIAL AUTHOR EVENT: Picture Book Creation with DIVA DELORES AND THE OPERA HOUSE MOUSE, Cranford Public Library, registration required. Ages 5 and up. Tuesday, April 17, 2018 4:00 pm. Participate in an interactive reading of DIVA DELORES THE OPERA HOUSE MOUSE, then create your own book-themed craft out of clay at the wonderful Fire Me Up Studio in Cranford! Signed copies will be available for purchase. More to come… check my Facebook Author Page for updates. This past Saturday I was delighted to participate in Cranford Public Library’s first ever PICTURE BOOK PALOOZA which featured six picture book authors sharing their books through readings, crafts, and a Q&A. Despite the glorious fall weather and many, many other fun events scheduled in Cranford on the same day, we had a nice gathering of families. I hope the pictures below give you a sense of the joy and love for reading that were celebrated at the event. Before the event began, each author set up her craft table. After the readings we had a brief Q&A. Then it was time to do some crafts and sign some books! A special thanks are in order for Anne Laird, owner of The Town Bookstore, for providing books for sale and signing. I’d also like to thank volunteer Michelle Howlett and her sweet daughter, Jane, for enthusiastically overseeing the book table. Aren’t they darling?! Finally, a special thanks to the Cranford Public Library for hosting this event, with extra special recognition given to Lauren Antolino for making this program a reality. She really went above and beyond in thinking through all the little extras that made the event extra special – like original Picture Book Palooza book marks for each child, fantastic promotional flyers and outreach, terrific coordination and communication with the authors, and little details that made the atmosphere in Room 200 extra warm and inviting – including colorful table cloths, a kid-designed mural, and a nice big, colorful and comfy rug for the kids to sit on during the story time and Q&A.